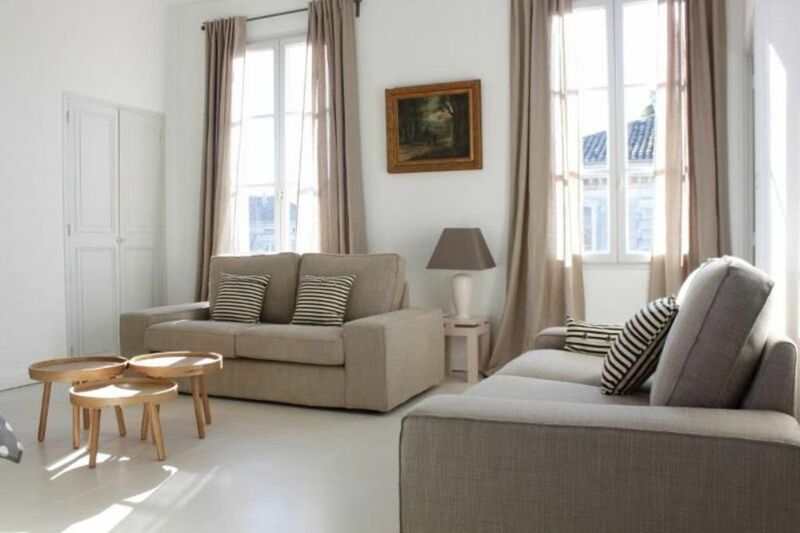 In the heart of intramural Avignon, on the 3rd and last floor of an old building with character, secure and quiet, beautiful bright and spacious apartment, fully renovated. -1 Small room in the center of the apartment with two sofa beds, each offering a bed for 1 person. This living room is crossed to go from room 2 to the toilet, the kitchen and the rest of the apartment. - 2 bathrooms with showers, and WC in one of the 2. * required information regarding the deposit: a deposit of 500 euros is required on arrival, not cashed and refundable on the day of departure after the inventory. Drugstore products are made available: out of respect for the following holidaymakers, it is advisable to replace a finished product! the toilet paper is provided to start the stay and not for the whole stay a cleaning fee applies at the end of the stay: 58 euros (not optional) thanks for your understanding !!!!! I thought the apartment was lovely but there were a few things that could be improved. For example the honoring board and the showers. With the apartment being up 67 stairs it is not for the faint hearted. We were also particularly bothered with mosquitoes. There was no television in any language other than French. of course we can find better but not at ths price for 3 rooms , 110m2 and a wonderful view of Avignon ! The apartment is on the third floor without elevator ( hihg floor ) as indicated on the web site. A beautiful flat, and we enjoyed the location. The flat is very spacious. Owner was helpful. Everything was clean and ready for us. Unfortunately we visited it during very hot days so it was a juggle between fresh air and bugs flying in at night. We traveled with our three kids and one thing to note is that the master bedroom is on the other side of the flat from the other two bedrooms. Great for privacy but perhaps tricky with younger children. We enjoyed our stay and would recommend the flat. This is a lovely, renovated apartment on the top floor in a nice, old building, so it also has some character (in a good way). Very sunny, but has shutters to block out the light for sleeping. There are two separate rooms with showers, one of which also has a toilet (I.e., one toilet for the apartment). The location is fantastic - just inside the old city wall, next to the Rhône, easy walking to heart of old city, but a couple blocks off the main tourist areas, so no noise. Dominique is lovely as well. Would highly recommend this place and would definitely stay here again. Fantastic flat in the perfect location! Perfect 3rd level (top level) flat for our family of 5. Bed were comfy and the kitchen was really well equipped. Bright and airy with beds for all. Heritage building with modern updates within. We would stay here again anytime. Owner was very responsive and helpful. We felt so at home in Dominique's apartment. (She was very easy to work with even though we do not speak much French and she speaks little English.) It was just the 2 of us which gave us plenty of room. The apartment could comfortably accommodate 4-6. The kitchen is well equipped so that you can enjoy shopping at Les Halles and preparing meals with the treasures of Provence. The location was just minutes from the Palias des Papes, Place de la Horloge, and the previously mentioned Les Halles. I would definitely recommend the apartment for longer visits as we were sad to leave after just 5 days. We had a car and just parked on the street, usually by the city wall. Mel M.Where do you live? We (2 people) stayed for a week. The apartment, a full floor has clearly been updated recently and is quite large with a very modern (upscale IKEA) kitchen. It's very light and airy - with windows on 3 sides and great views. The location is terrific - a few blocks from the major sites in Avignon, a small supermarket, all the restaurants and cafes etc. The owner lives on site and is very friendly and helpful. The "only caution" is for those who might have mobility problems - it is located on the top floor requiring 3 large flights of stairs. If that's not an issue, you will love this place.